Draft: 2008, Florida Marlins, 8th rd. Isaac Galloway...both father, Isaac Galloway III (Phillies), and grandfather, Isaac Galloway II (Orioles), played professional baseball... signed letter of intent to play baseball at San Diego State following graduation from Los Osos (CA) High School in Rancho Cucamonga. Had contract selected from Triple-A New Orleans on July 31 and made MLB debut that night at Atlanta as a defensive replacement in left field; recorded infield single in first career plate appearance in 9th inning...According to the Elias Sports Bureau, his 947 career Minor League games prior to his MLB debut were most by a Marlin since Brian Daubach had 965 before his debut on September 10, 1998...Entered season with 3,077 career Minor League at-bats across 855 games...On August 19 at Washington, recorded first career home run and RBI, while posting first three-hit game...Had first career walk-off hit and RBI on September 21 vs. Cincinnati, on a 10th-inning double in a 1-0 win..At time of selection, ranked tied for fourth in Pacific Coast League in stolen bases (20), and sixth in runs scored (64)...Hit .310 (22x71) in June for New Orleans, with a .592 slugging percentage (6 2B, 3B, 4 HR)...From June 1 until selection to Major League roster, was batting .294 (40x136) with 12 doubles, a triple, six homers, 15 RBI, and eight steals in 43 games for Baby Cakes. Missed most of season due to sprained MCL in left knee, appearing in just 49 games at four different levels...Began campaign at Triple-A New Orleans and hit .172 (5x29) with two home runs and six RBI over 13 games before being transferred to Double-A Jacksonville on April 21...In 10 games following transfer, posted .405 average (17x42) with five doubles and three RBI with Jumbo Shrimp. Recorded at least one hit in first nine games, including a season-high four-hit effort on April 27 vs. Mobile...Promoted back to NOLA on May 2 and in next 13 games hit .348 (16x46) with five home runs 10 RBI...Drove in season-high four runs on May 13 at Reno...Left May 17 game against Salt Lake Bees after injuring left knee on play at plate in first inning...Placed on seven-day disabled list on May 18 with left knee sprain and aggravated injury on rehab assignment with GCL Marlins. Began second rehab assignment on August 30 with GCL Marlins and was reinstated from DL on Sept. 2. This wasn’t a great throw -- it was insane! April 16, 2019 Miami Marlins selected the contract of RF Isaac Galloway from New Orleans Baby Cakes. February 8, 2019 Miami Marlins sent RF Isaac Galloway outright to New Orleans Baby Cakes. 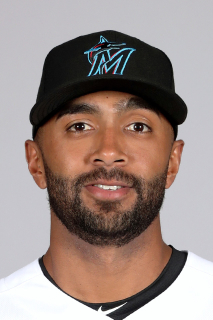 February 4, 2019 Miami Marlins designated Isaac Galloway for assignment. July 31, 2018 Miami Marlins selected the contract of RF Isaac Galloway from New Orleans Baby Cakes. April 3, 2018 RF Isaac Galloway assigned to New Orleans Baby Cakes from Jupiter Hammerheads. February 8, 2018 Miami Marlins invited non-roster CF Isaac Galloway to spring training. September 2, 2017 CF Isaac Galloway assigned to Jupiter Hammerheads from New Orleans Baby Cakes. August 30, 2017 New Orleans Baby Cakes sent CF Isaac Galloway on a rehab assignment to GCL Marlins. July 6, 2017 New Orleans Baby Cakes sent CF Isaac Galloway on a rehab assignment to GCL Marlins. May 18, 2017 New Orleans Baby Cakes placed CF Isaac Galloway on the 7-day disabled list. May 2, 2017 CF Isaac Galloway assigned to New Orleans Baby Cakes from Jacksonville Jumbo Shrimp. April 21, 2017 CF Isaac Galloway assigned to Jacksonville Jumbo Shrimp from New Orleans Baby Cakes. March 23, 2017 Miami Marlins optioned CF Isaac Galloway to New Orleans Baby Cakes. January 3, 2017 Miami Marlins invited non-roster CF Isaac Galloway to spring training. January 14, 2016 Miami Marlins invited non-roster CF Isaac Galloway to spring training. April 24, 2015 CF Isaac Galloway assigned to New Orleans Zephyrs from Jacksonville Suns. March 30, 2015 CF Isaac Galloway assigned to Miami Marlins. December 10, 2014 Miami Marlins signed free agent CF Isaac Galloway to a minor league contract. December 10, 2014 CF Isaac Galloway assigned to Jacksonville Suns. March 14, 2014 CF Isaac Galloway assigned to Miami Marlins. July 26, 2013 CF Isaac Galloway assigned to Jacksonville Suns from Jupiter Hammerheads. June 29, 2013 Isaac Galloway roster status changed by Jupiter Hammerheads. March 9, 2013 LF Isaac Galloway assigned to Miami Marlins. September 19, 2012 Jupiter Hammerheads activated LF Isaac Galloway from the 7-day disabled list. June 18, 2012 Jupiter Hammerheads activated OF Isaac Galloway from the 7-day disabled list. April 5, 2012 OF Isaac Galloway assigned to Jupiter Hammerheads from Greensboro Grasshoppers. March 6, 2012 OF Isaac Galloway assigned to Miami Marlins. August 5, 2011 Isaac Galloway roster status changed by Greensboro Grasshoppers. April 16, 2011 Greensboro Grasshoppers activated OF Isaac Galloway from the temporarily inactive list. April 11, 2011 Greensboro Grasshoppers placed OF Isaac Galloway on the temporarily inactive list. April 7, 2011 OF Isaac Galloway assigned to Greensboro Grasshoppers from Jupiter Hammerheads. March 30, 2011 OF Isaac Galloway assigned to Florida Marlins. September 23, 2010 Isaac Galloway roster status changed by Jupiter Hammerheads. May 19, 2010 Jupiter Hammerheads placed OF Isaac Galloway on the 7-day disabled list retroactive to May 18, 2010. May 19, 2010 Isaac Galloway roster status changed by Jupiter Hammerheads. April 7, 2010 CF Isaac Galloway assigned to Jupiter Hammerheads from Greensboro Grasshoppers. April 1, 2010 CF Isaac Galloway assigned to Florida Marlins. June 17, 2009 Isaac Galloway roster status changed by Greensboro Grasshoppers. May 11, 2009 Greensboro Grasshoppers placed RF Isaac Galloway on the 7-day disabled list retroactive to May 8, 2009. Left wrist sprain. June 14, 2008 Florida Marlins signed CF Isaac Galloway.